Mindset is a unique device – part EEG, part headphone. Equally unique, is our value proposition: by measuring your brain activity, we improve your concentration while you work. This claim is the foundation of our product. The following documents presents the case for the premise underlying Mindset: by alerting people whenever they get distracted, we condition their subconscious to better recognize and tune out distraction, ultimately improving their concentration permanently. Below you can find an explanation of the key components of our technology and studies that support it. Embedded in Mindset are five electroencephalography (EEG) sensors: three in the upper band, and two in the ear cups. These sensors measure the electrical activity produced by large populations of neurons firing in the upper cortical layer of your brain. The technology is nearly 100 years old – in labs today, EEG is used to diagnose problems such as brain trauma and epilepsy, as well as measure cognitive states such as attention, workload and sleep. 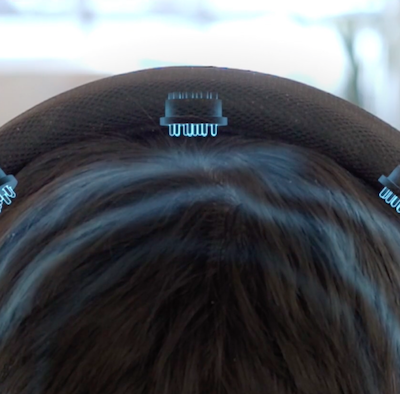 In clinics, measuring EEG requires large, cumbersome equipment: a 64 to 256-electrode cap, attached to your head using conductive paste, wired to a $50,000+ terminal. Setting up a measurement takes up to 60 minutes, and requires a trained clinician – far from convenient. Until recently the ability to measure brain activity has been confined to labs. In the last decade, advancements in materials, electronics, and machine learning have enabled cheaper EEG devices, without all the complexities and costs of clinical-grade equipment. These improvements have enabled Mindset to measure concentration discretely from within a headphone. With the discovery of neuroplasticity in the late 20th century, neuroscientists began to understand how the brain’s ability to change affects our ability to learn through affecting behavior. At the heart of this research was the idea of operant conditioning: using positive and negative stimulus training to modify human behavior. This theory gave birth to many clinical psychology practices. Behavioral Parent Training, one of the early treatments for ADHD, uses these principles to improve attentiveness in children. Eventually, operant conditioning merged with several other behavioral therapies to form Cognitive Behavioral Therapy, which remains the first line of defense against most mental disorders. Alongside these advancements, new biosensors enabled new forms of operant conditioning. Coined biofeedback, clinicians used physiological sensors to automate an operant training routine. Since the sensors were both faster and more accurate, new therapies became possible: stress reduction through Heart Rate Variability, physical rehabilitation through Real Time Ultrasound, and most relevantly, improving attention through EEG neurofeedback. Biofeedback is the foundation of Mindset. Using modern artificial intelligence algorithms, Mindset detects the patterns in the EEG signal that indicate a focused or distracted mental state. We currently focus on several metrics such as your level of cognitive engagement and the level of distractibility you are experiencing. Whenever we detect that you are distracted, we send a subtle auditory cue – a small increase in the volume of your music – to remind you to refocus. This feedback acts as a negative reinforcement, training your subconscious to better recognize and tune out distractions inherently. Thanks to neuroplasticity, over time your brain internalizes this feedback, rewiring itself to favor states of deep concentration. Our goal at Mindset is to bring EEG out of the lab – to use modern Neuroengineering to enable people to become their best selves.